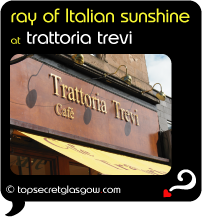 Trattoria Trevi is easy to miss on the busy Kelvinbridge stretch of Great Western Road. And it's worth the effort to find. Step inside, and you can almost believe you're in an Italian diner just off a quaint piazza! Small and chic, Trattoria Trevi serves up real dishes from Italy, so be prepared for a hint or two of garlic! The bruschetta arrives with a garlic, tomato and olive oil mountain tumbling onto the plate, and the pate is rich and pleasing. Look out for the simply perfect creamy spaghetti carbonara, and the veal milanese which is crispy as it melts in the mouth. Another top dish is their chicken and mushroom risotto. And remember to leave room for tiramisu! Great news! Finding this page means you can now join our VIP list for Trattoria Trevi. Time to grab your very own page all about Trattoria Trevi. Do you have a special story about Trattoria Trevi? A funny experience? A grand occasion? A funky photo? A personal tip? A top secret? Filling up the Kids at Trattoria Trevi! overground Charing Cross (Glasgow) walk drive!